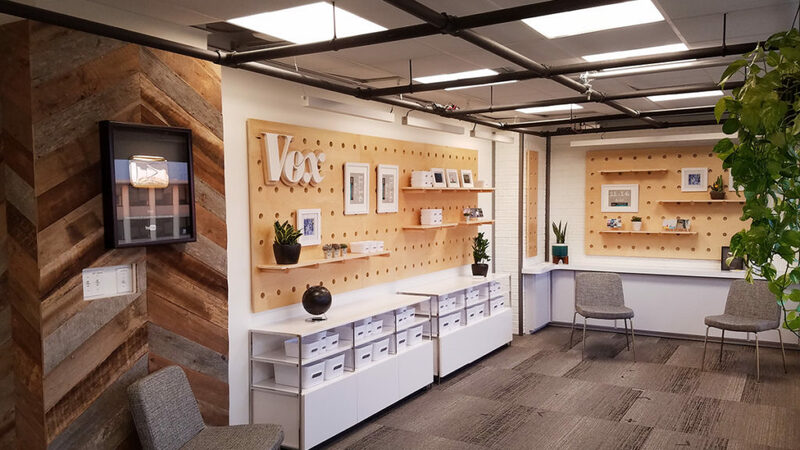 As part of a renewed focus on video, Vox, the flagship site of Vox Media, needed to create functional studio environments to give its productions a professional look and feel in both its Washington, D.C. and New York City offices. 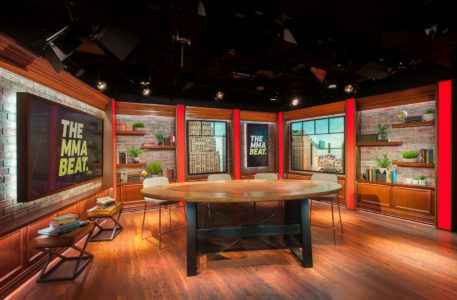 Vox turned to Camille Connolly of 3C Studio to create a unique studio configuration that combined functional workspaces with all the bells and whistles of a professional TV production studio and gave the video team the flexibility to create multiple unique looks for each show. 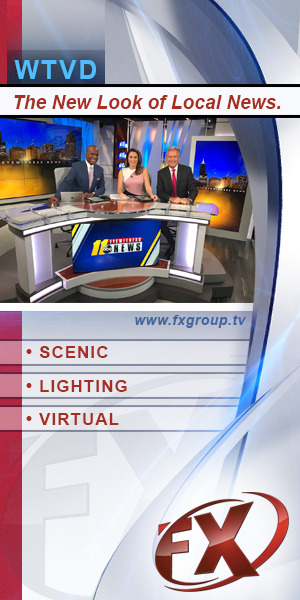 With Vox inside typical office space, the grid and studio sizing had to have special attention paid to the scale of the design and how it influenced the on-air look, said Connolly. Set dressed for “The MMA Beat.” Photos courtesy of 3C Studio / Raeford Dwyer. The studio, which is about 20×25, includes a collection of interlocking set pieces on casters — designed to appear as built-in shelving units, faux windows or video panels. When creating the rolling units, however, close attention was paid to how the pieces interacted together. “I tried to maximize the space there and give them a whole bunch of rolling units that were interchangeable but that would work together,” explained Connolly. So, while the design still offers building-block style flexibility, a great deal of planning went into focusing how the pieces, when put together, looked, which meant Connolly had to think of them not only individually but as part of multiple wholes. This included taking a close look at how each set was dressed. 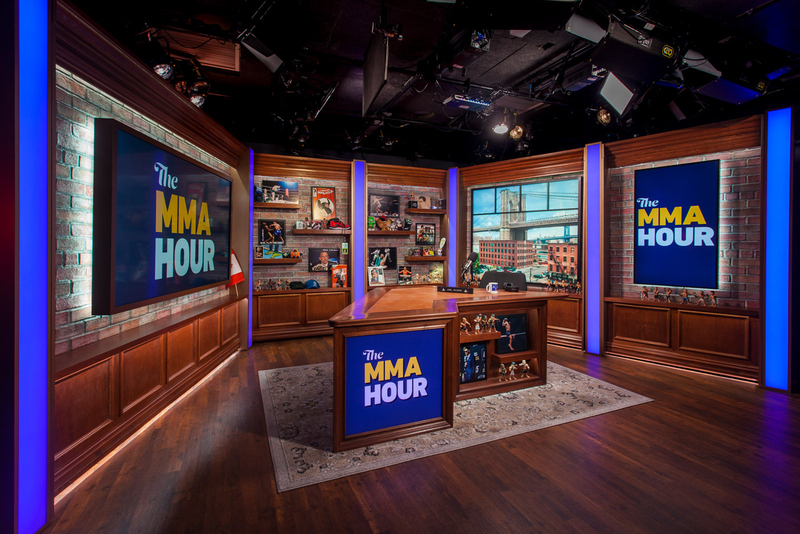 At this point, the New York sets are being used for “The MMA Beat” and “The MMA Hour,” two shows focused on mixed martial arts. Set dressed for “The MMA Hour.” Photos courtesy of 3C Studio / Raeford Dwyer. 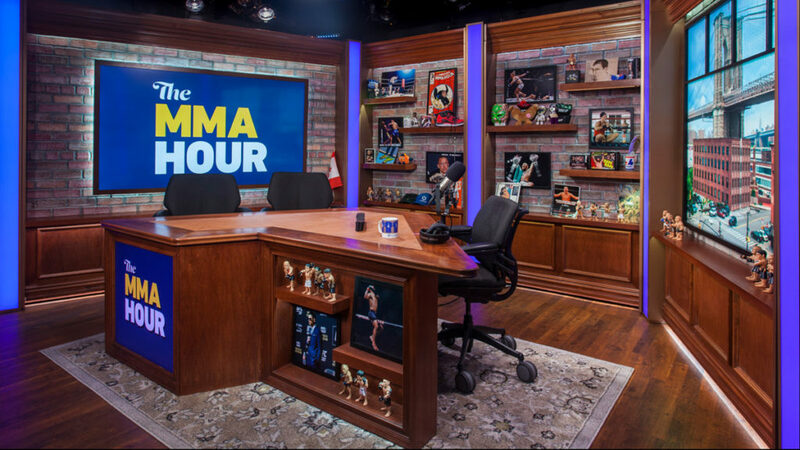 “Hour,” on one hand, is much less formal and stocked with collectibles from the personal collection of host Ariel Helwani, which full the built-in floating shelves. For “Beat,” however, Vox wanted a bit more formal look, so the decor is focused more on books and small potted plants to add a pop of green to the design. “Beat” also has a more traditional, but still relaxed seating and table arrangement — a wide oval with stools, while “Hour” features a unique polygon-shaped surface with finishes and accents found in fine furniture. 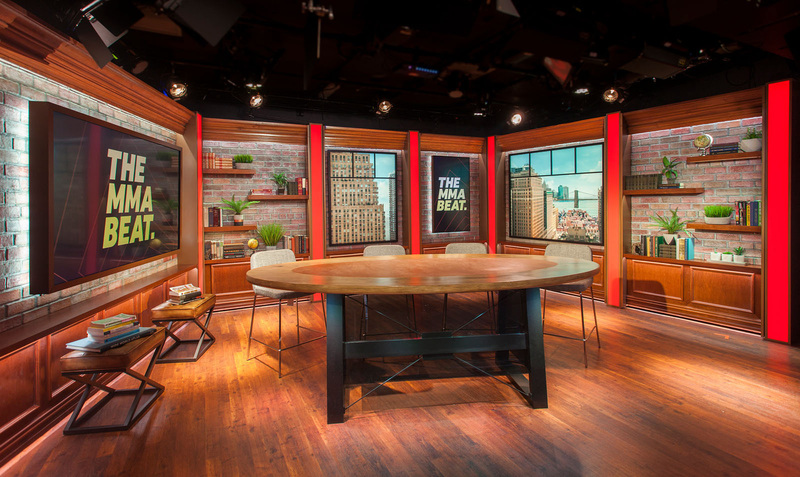 The D.C. space, on the other hand, doesn’t include a traditional desk, aiming for a more modern workspace vibe, creating a branded environment for shooting a variety of shows or segments. For this space, Vox’s team wanted flexibility, with Camille noting they wanted someone to come in and set up a pattern to follow and experiment with. 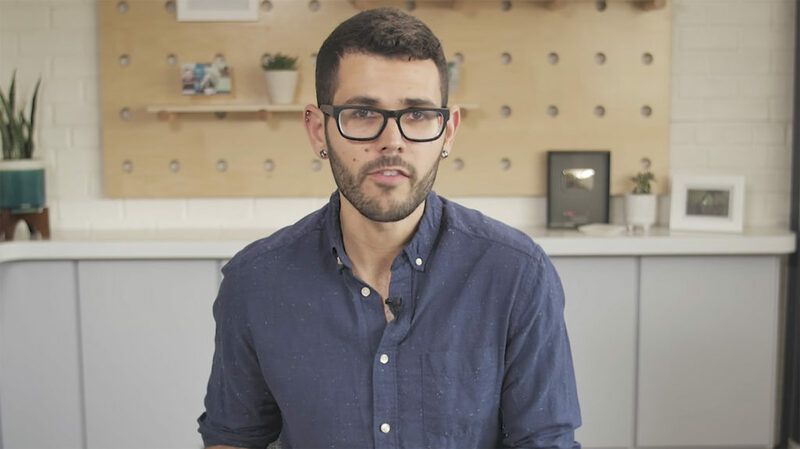 At the end of the day, both spaces will no doubt continue to evolve as Vox continues its investment in video, following the ever-changing landscape of digital video, something Connolly sees Vox as a leader in. “I think it really says that this is the direction that we’re going to see a lot more people going and it’s really good for people to start investing in what their setup actually looks like and sounds like,” she said. Vox Washington. Photo courtesy of 3C Studio / Camille Connolly. The studio spaces 3C created for Vox will also be able to shift as strategies and productions change — which not only maximizes the company’s investment but will allow for a consistent, streamlined look across all of its productions while still giving each one a bit of a unique look. Scenic Design by Camille Connolly / 3C Studio, Inc.